**Products Provided** Hey everyone! I know it's been awhile, but I'm still here (if anyone was wondering?!) 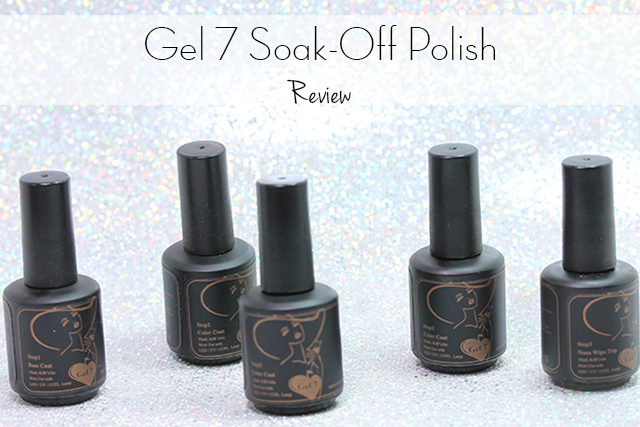 So for today's post I have some gel soak-off nail polish review, from a new-to me brand called Gel 7. Lately I've been on a gel polish frenzy and loving it. I never knew I can have so much fun using gel polishes, especially with nail art. 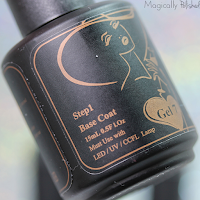 "What is the biggest difference between Gel 7 Gel Polish and other brands of Gel Polish? Gel 7 Gel Polish does not contain any of artificial solvents, which are harmful to the human body. 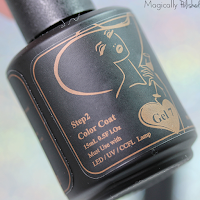 Additionally, Gel 7 Gel Polish provides the most saturated color and shine. One thin layer of Gel 7 Gel Polish will make you proud of your nails. Do you know why my nails get thinner and ruined after using Gel polish for a while? Because most of the Base Gels of Gel Polish use cheap Resin (a sticky flammable organic substance), or add strong acid (Ph value 3 or even 1) to help the bonding. The Ph value of Gel 7 Base Gel polish is 6." 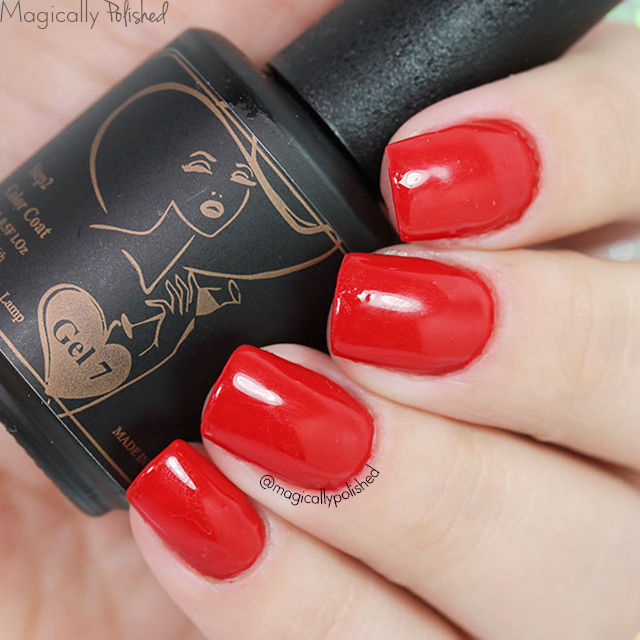 Red Delicious- is a cherry red creme and a very beautiful shade and very saturated. This is definitely a one coater and the application is very smooth. This is one coat, sealed with their Gel 7 top coat. 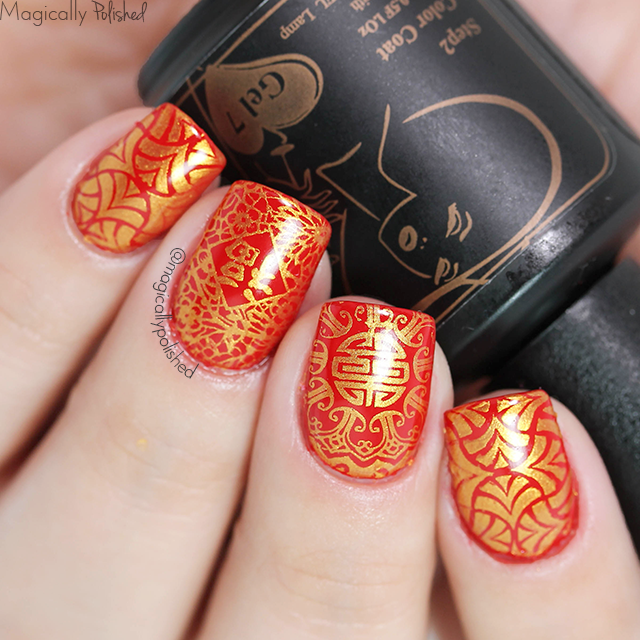 For this look, I created a perfect design for the Chinese New Year! 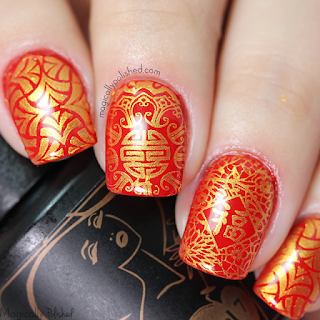 I already knew by wearing this shade it would be the best to use Bundle Monster: Occasion Stamping Collection. As per usual, I applied the gel nail polish as instructed. Once it was set, I stamped the the preferred design using a gold stamping polish. I real love how these came out. Steel Cut- is a grey creme and a gorgeous color. I have to admit I rarely like grey for a nail polish or color in general, but this one is definitely a fave. It's light in color and applied smoothly, even in just one coat. For this look I was inspired by a pattern I found Pinterest. I was surprised to find one with the exact colors I recieved. Over the base I added a dry brush using a white nail polish. I then added a few dots using a black nail polish and over Canary Craze. I couldn't help and admire the color combo. Canary Craze- is lemon yellow creme and the perfect shade for the upcoming spring. The formula was just perfect and applied perfectly on the nails. This is one coat sealed with gel top coat. 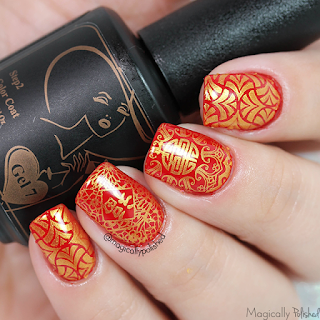 For this look, I wanted to create another stamping design using Bundle Monster: Blogger Collaboration stamping plates. 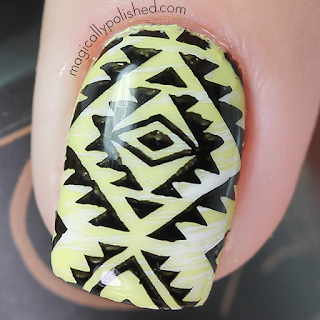 I simply added a dry brush using a white polish, for the background and stamped the tribal designs and "v" using black stamping polish. I really love how this look and the design overall. Overall I am very impressed with Gel 7 gel polishes and their unique shades. Seriously one of the best gel polishes in application! It was smooth and very to easy apply. I even love their top coat, no need for wiping off the stickiness with a alcohol wipe. I only wish it lasted a little longer, with just a week of wear. As for the removal process, I completely for got to take pictures. However, it was very easy to remove and left little residue. I just simply buffed my nails lightly and it was perfect. You can purchase this set from Gel 7 for $12.95 each on their site.